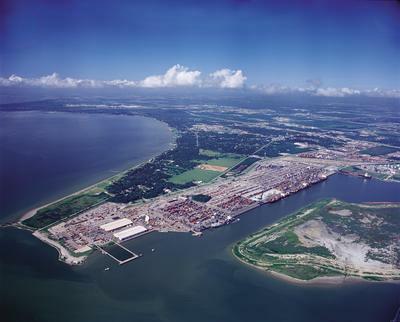 The Port of Houston is one of the nation’s largest and busiest container ports. Barbours Cut Terminal, the largest facility of POHA, handles enormous amounts of freight in and out, resulting in continuous heavy wear and tear on their concrete paving. In addition to the incredible loads, the facility, being located along the ship channel suffers from poor and unstable subsoil which further stresses the concrete systems. 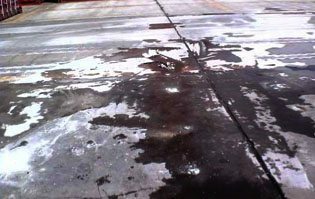 Besides heavy loading, the other major cause of paving failure is water penetration below the slab thru expansion joints. Once water enters thru the joint, traffic causes the slab to flex resulting in “pumping” of water and soil from beneath the slab. Voids thus created, worsen to the point that slab failure results and replacement was the only option. Because this water intrusion occurs most often where the transverse and longitudinal joints cross, the corners of the panels fracture and the classical “pothole” develops. This failure at panel corners has been dubbed “4 corner phenomena”. issues. Not only is the paving lifted very accurately back to it’s intended elevation, but it is also re-supported on a bed of strong, dense, long-lasting material that will not decay or deteriorate over time. It’s also important that the hydro-insensitive and hydrophobic material seals to the underside of the slab, thus blocking out water intrusion thru the joints and under the slab, so “pumping” is eliminated. The speed at which the URETEK Gulf Coast Team completed the process and the fact that traffic was able to immediately return to the area are major advantages of using the URETEK Method for Barbours Cut. 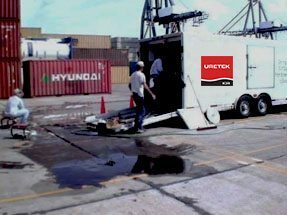 The rapid expansion and cure time of URETEK’s geo-polymer is an ideal solution for busy ports across the country. Multiple locations in the Barbours Cut Terminal traffic lanes were identified for repair based on extreme use and importance to ongoing commerce. After port officials evaluated the positive results achieved including the durability of the repairs under continual heavy traffic use, the port selected additional areas for repair using URETEK.